announced they are taking vehicle tracking to new levels. Sure to be maligned by teenagers, OnStar will be offering 10,000 of its subscribers the chance to try out Family Link, a new optional service that will allow people to log on to a Web site to see the exact location of a family member's car or set up e-mail or text message notifications about where a vehicle is. According OnStar, the service may someday be compatible with OnStar FMV, an aftermarket installation of a custom rear-view mirror that uses the OnStar service. This attachment sells for $299 and subscribing to OnStar service costs $199 a year. According to AutoBlog, State Farm has partnered with Hughes Telematics to introduce a new vehicle services system called In-Drive that will let users receive speed and location alerts on their vehicle while another family member is behind the wheel. State Farm can also use the device to monitor driving habits, so if a person behaves well behind the wheel it could result in lower insurance rates. It's not clear if rates would get hiked if the company noticed unsafe driving. 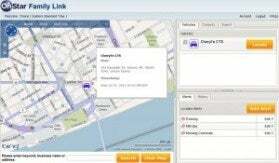 Chicago-based Applus also announced vehicle tracking news. Its wireless vehicle telematics device, the A+ Tracker, has earned certification for use over the Sprint wireless network and can be programmed to flag anything from a teen's distracted driving to a taxi driver's excessive speed. Sprint is the first wireless carrier to enable the device on its network. The A+ Tracker is a self-installed aftermarket device that captures and transmits data across more than 70 vehicle and driver-performance statistics such as vehicle speed, fuel use, hard braking, and emissions performance. Applus says enterprise clients and application developers can customize the A+ Tracker using a host of business and consumer apps that wirelessly connect the car to vehicle data services. Several similar car performance tracking applications were unveiled at the Consumer Electronics Show earlier this year. But a focus on helping teens drive more safely is behind a number of projects from car manufacturers and insurance firms. Ford's MyKey feature, which debuted as standard equipment on the 2010 Ford Focus and is now standard on nearly all Ford and Lincoln models, allows owners to program a key that can limit the vehicle's top speed and audio volume. MyKey also encourages safety-belt use, provides earlier low-fuel warnings and can be programmed to sound chimes at 45, 55, and 65 mph. Jim Motavalli, writing for BNET, points to several other tools parents can use to monitor teen driving, such as the $249 Mobile Teen GPS unit, which will monitor how fast your kids are driving, find where they are in real time, and record if they're visiting "unapproved locations." iGuardian Teen costs $19.95, and it does things like prevent texting and making calls while driving. It will also record video through a dash camera in five-minute loops, and automatically upload them in case of an accident. Safe Driver is a free iPhone app that emits beeps to warn speeding drivers. PhoneGuard DriveSafe is a free app that disables phone texting, e-mail, and keyboard functions at speeds above 10 mph. Would you monitor your teen's location and driving behavior? Would you let your insurance company see how you or your family members are driving?